Holiday treats – are you allowed to eat more just because it’s your holiday? Does this sound familiar? Do you feel “entitled” to eat more sugary food, drink more alcohol and eat all those things that you wouldn’t eat or try to stay away from when you are at home? The quick answer is, there is no right or wrong, and that it depends on the individual. One of the major issues that many of us have with food, is that we associate certain foods with “reward”. It often goes back to our childhood, where we were actually rewarded for being a good child, for having eaten our greens or simply because it was our birthday. This is something that is so engrained in our brains, that it is extremely hard to get rid of or undo. The first step is to be aware of it. It is only a taught BELIEF, it is not the truth, there is no fact or any reasoning behind it. Unfortuately, the food industry has hijacked this belief and is trying to re-inforce it constantly. So much so, that if you deny ourselves of something sweet or of this treat, we actually feel “deprived”, and as if there is something taken from us that is our entitlement or something that we deserved. But do you deserve to treat your body badly? That sugar hit is only so short lived. And often, you don’t even fully enjoy and savour what you are eating. You wolve it down, and before you know it it’s gone. So, even the argument that you deserve to treat yourself is completely not even true. If you were treating yourself it would benefit your body, your health, and you would fully savour it, like a day in the spa, a lovely massage, lying on a deckchair in the sun! When was the last time you really fully enjoyed your sweet treat? Don’t get me wrong, I too love my desserts, or certain dessert anyway, where I can’t resist. And I am not trying to tell you not or never to have any dessert in your life. But, if you could only enjoy it as if it was your favourite savoury dish, then it would not be a problem at all – unless, you have a health condition or you’re trying to lose weight! Do you have to lose weight? Are you blood sugar levels high? Do you have energy slumps? Do you often feel “hangry”? Do you often feel anxious or jittery if you don’t get food? Do you often have cravings? 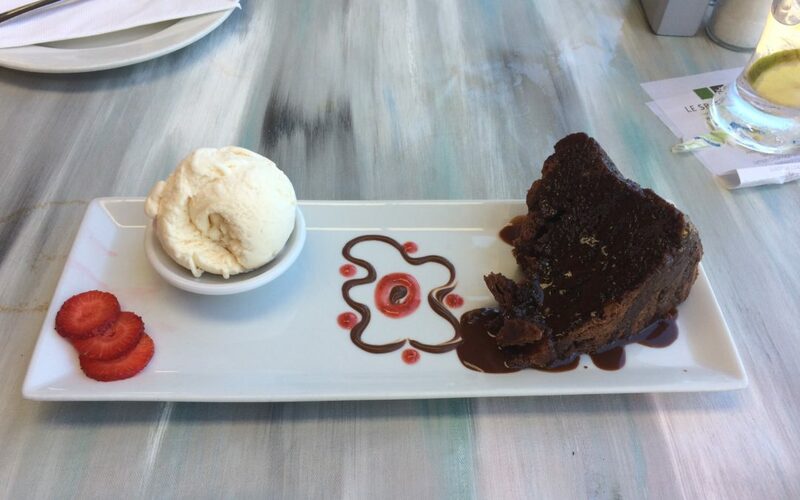 Do you feel you need to have something sweet after every meal? If you answer yes to those questions, you are doing yourself absolutely no favour with anything sweet. It’s like putting gasoline in the fire. You are just making things worse. If you are completely healthy and of a healthy weigth, there’s nothing wrong with having sweets every now and then. The thing is, that sugar does light up our happy hormones, and that’s why you feel happy – only for short time, and then you actually feel worse and possibly even guilty. And do you want to feel worse and guilty while you are on holidays? Not really – that’s why you are telling yourself that you deserve it, and that’s why you are trying to “over-write” all logic. The drive to this short-lived happiness is so strong that it is hard to over-write. You could argue, yes, holidays are there to be enjoyed, but do you really enjoy them, when you have digestive issues, when your energy levels are low and when you know that when you come home, you’ll have to go on a diet – again!? Like everything in life, it’s your choice. Choose to have that brownie and consciously know that you are going to put on weight. Chose that cake and know that your insulin is going to go through the roof. Choose that ice-cream and know that you will get an energy dip later on. It’s not just your annual holidays, it’s often also the short break, the long weekend, the birthday, Easter, Christmas, etc etc. There will always be days for “excuses”. But the same way you use the excuse that it’s a special day, you could also argue, it’s only one day in my long life, or only 2 weeks of my life. And if you have to lose weight or if you are dealing with a health issue such as diabetes, you need to get back to your health first, before you can have those “sweets” again, and what is maybe even one year of consciously avoiding sugar and eating low GL carbohydrates in your whole life? Get your health back first. Get your weight down first. That is your priority if you want to live a better quality of life. Don’t argue that life is not worth living without sugar. It’s worse living with serious health issues. The beauty with sugary foods is that the less you eat them, the less you will crave them. If you consciously give up sugar for a while, your cravings will go as well. And if you don’t crave them, then you will be able to just have the occasional treat just like your favourite dinner which you also don’t have every night. If the thought, of giving up sugar for just 2 weeks, scares you, that is actually when you need to do try it most. I would highly recommend anyone to take on a sugar-free challenge every once in a while. If you don’t think you can do it on your own, please contact me or check out when I’m doing a guided challenge again. What is boycotting your weight loss efforts? It is NOT your lack of willpower! Top 10 Tip for a Merry Healthy Christmas!